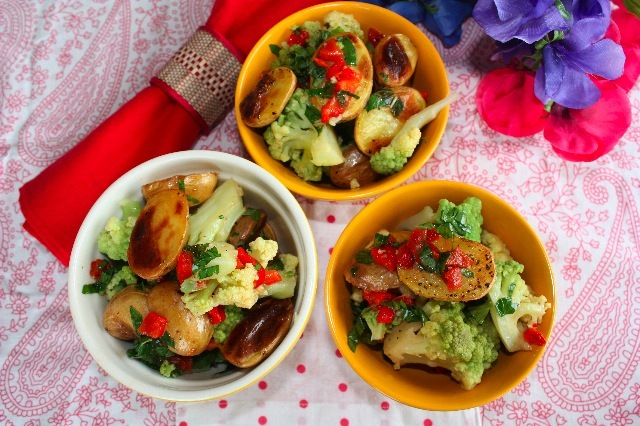 Frais et léger – romanesco vapeur, pomme ratte grillées et vinaigrette de poivrons grillés aux herbes. This is a little unusual salad, but quite intersting in terms of flavors and texture, I like it lukewarm or cold but not hot. The heat will alter the vinaigrette flavors. 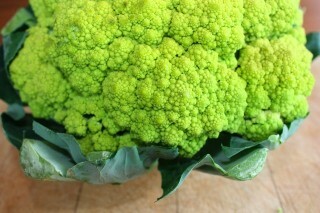 This is green cauliflower and not romanesco broccoli but is similar, it has a different head shape, which is pointier on the romanesco. Its beautiful green lime color makes it quite appealing to the eye, and if you like cauliflower there is no reason you would not like this. Vegetable salads are interesting in terms of nutrition and certainly always appreciated if you are feeding vegetarians. I believe that if the world was vegetarian, there would obviously be no animal raised to feed humans and less animal spread virus and bacteria. I prefer to steam vegetables rather than boiling them, they keep their nutritional values and flavor that way. Cut and wash broccoflower, and steam in a steamer for about 10 minutes. Was potatoes and cut in halves. Add salt pepper, 2 tbs olive oil and vinegar, mix well and broil at medium heat until both sides of potatoes are well browned and soft in the inside. For the vinaigrette, first grill pepper in the oven under the broiler, until the skin becomes dark and starts separating from the flesh. Remove from the oven, let it cool – some people like to place it in a plastig bag for easier peeling but it works as well if you don’t leave in a plastic bag. Peel and remove seeds and cut pepper in small cubes, place in a mixing bowl. Add finely chopped herbs, oil, vinegar, lemon, garlic and shallots, salt and pepper. 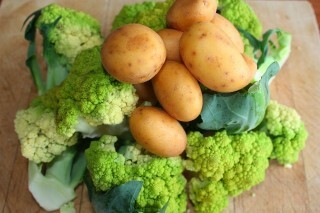 Mix well and pour on top of potatoes mixed with broccoflower. Serve lukewarm as a side dish or as a salad. This entry was posted by silvia on May 2, 2009 at 3:06 pm, and is filed under Express - Less than 30 minutes, Side Dish, Vegan, Vegetables. Follow any responses to this post through RSS 2.0.You can leave a response or trackback from your own site. You have a good point with being vegetarian to lessen the risk of pandemia. 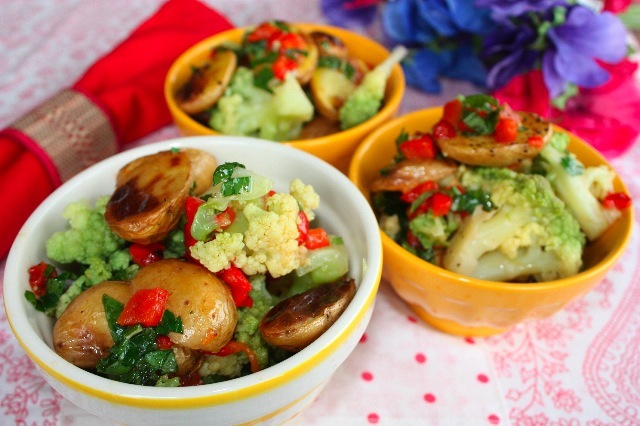 looks delicious, great for a summer day, I love the fact that works as a side dish or as a salad. What beautiful photos and lovely colors in this dish! I like the use of several herbs in the dressing. Thanks Laura, yes, vegetables are so versatile, I like to just eat a whole bowl of them, nothing else. Thanks so much, I’m glad you like them. I just want to convince some people that vegetables are so NOT boring, and besides the fact they’re healthy, they’re tasty too! Simply gorgeous and appetizing! Thanks for the link from Foodbuzz! Thank you Gabrielle for checking out my recipes. Glad you like them! Simple and healthy. Thank you very much for sharing. Cheers ! Thanks for reading and sending feedback! If only I had a buck for each time I came to http://www.citronetvanille.com.. Incredible article!